Turn your mobile device into a music controller for Sony's Network Audio products. Instantly access your personal music collection and play it on some of Sony's network audio systems located anywhere in your home, wirelessly. Network Audio Remote for iOS devices can be downloaded from iTunes App Store. Network Audio Remote for Android devices is available from Google Play™ store. - Not all Android devices support the Network Audio Remote feature. Check with the device manufacturer for additional information. - The Google Play store was formally called the Android Market. If your Android device shows the Android Market App instead of the Google Play store app, you may need to update the device. By setting up your computer as a DLNA server, you can stream media, such as music over your network to a DLNA supported device. DLNA devices include certain Hi-Fi component systems and computers. If you are using third-party firewall or security software, you must configure it to allow the DLNA serveraccess to your network. Not all VAIO® computers have the VAIO Media plus software. To see if your computer has a it, check the specifications, which are available through the Manuals/Specs/Warranty link on this page. If using the Windows Media® Player 12 software and the Windows®7 operating system, follow this procedure. How to set up a DLNA server using the Windows® 7 operating system. You must be connected to a network for this procedure to work properly. Configure your network location as Home or Work. Home network: Choose this location when you trust the people and devices on the network. You can set up a Homegroup with this location type. Network discovery is turned on which means you can see other computers on the network and other computers can see your computer. Work network: This location type is configured the same as a Home network location but you cannot set up a Homegroup. 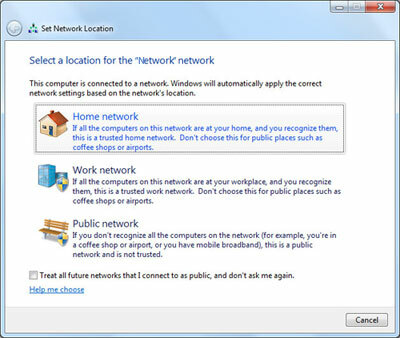 Public network: Choose this option when connecting to a public network, such as a coffee shop or airport, the Internet without a router or a mobile broadband connection. The Homegroup is not available and Network discovery is turned off. 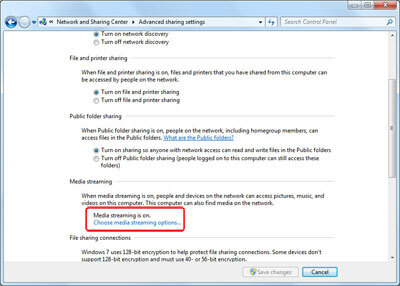 In the Network and Sharing Center window, in the View your active networks section, click the current network location. In the Set Network Location window, click the appropriate location. Note: If you change the location to Home, a Create a Homegroup window is displayed. Click the Cancel button or proceed to set up a Homegroup. Click the OK button. After you set up the DLNA server, follow the set up instructions for your DLNA device to connect to the server. If using the Windows Media Player 11 software and the Windows Vista® operating system, please visit this link. If using the Windows Media Player 11 software and the Windows XP operating system, please visit this link. If you are using the VAIO Media™ plus software, follow this procedure. How to set up the VAIO Media plus software as a DLNA server. Important: The procedure below will automatically configure the Windows® firewall, but if you are using third-party firewall or security software, you must manually configure it to allow the DLNA server access to your network. In the All Programs menu, click VAIO Media plus. Important: If you are starting the software for the first time, choose Easy Setup and continue with step 4. In the VAIO Media™ plus window, double click Communication Settings and then double click Easy Setup. In the Easy Setup window, click the right arrow. In the Easy Setup settings will start window, click the Yes button. In the Setting of the following items is complete window, click the right arrow. In the VAIO Media plus uses a content analyzer function window, click the right arrow. In the Easy Setup Settings are complete window, click the Exit button. After you set up the DLNA server, follow the set up instructions for your DLNA device to connect to the server. If you are using the EyeConnect® software and the Apple® Mac OS® operating system, follow this procedure. How to set up a DLNA server using the EyeConnect® software and the Apple® Mac OS® operating system. The EyeConnect software is available on the Elgato® website. Both the computer and the DLNA device must be connected to the same network for this procedure to work. If you are using third-party firewall or security software, you may have to configure it to allow network access for the EyeConnect software. Click the System Preferences icon on the dock. In the System Preferences window, under Other, click EyeConnect. In the EyeConnect window, verify the EyeConnect software is running. Note: If the EyeConnect software is not running, click Start button. In the Devices: section, verify your DLNA device is showing, enabled, and has an IP address. Note: If your DLNA device is not showing or does not list an IP address, verify it is set up and connected properly per the manufacturer's instructions. For more information about the EyeConnect software, consult the Operating Instructions or visit the website. Note: If you customized your security settings, additional configuration may be required. Consult the help files or contact the manufacturer of the software for more information. Norton™ Internet Security 2011 and 2010 : No configuration required. Trend Micro™ Titanium™ Maximum Security 2011: No configuration required. Trend Micro Internet Security 2010: No configuration required. In the All Programs menu, click the Kaspersky Internet Security folder and then click Kaspersky Internet Security. In the Kaspersky Internet Security window, click Settings. In the Settings window, in the left-pane, click Firewall. In the right-pane, click the Settings... button. In the Firewall window, click the Networks tab. On the Networks tab, click to select your network and then click Edit. In the Network connection window, next to Status:, click the down-arrow and then click Trusted network. In the Firewall window, click the OK button. In the Settings window, click the OK button. My mobile device cannot connect to the wireless LAN network. Check the following items when the mobile device cannot connect to the wireless LAN network. Check that the Wi-Fi function is enabled on the mobile device. Check that the network name (SSID for the wireless LAN router/access point) appears on the list "Choose a Network....". Check that the IP address has been correctly obtained. If the error message "Unable to join the network XXXX" appears, it is possible that you have enabled MAC address filtering on your wireless LAN router/access point or that you have selected the wrong network. My iPhone cannot connect to the home network. Check the following items when the mobile device cannot connect to the home network. Check if the client devices and wireless LAN router/access point away from devices that emit electromagnetic radiation (such as microwave ovens, cordless phones, etc.) or other wireless communication-capable devices. If such devices are present nearby, electromagnetic interference may occur and this could result in poor wireless network performance. Check if there are any obstacles, such as metallic elements or walls that could lead to poor wireless network performance near your server, client devices or wireless LAN router/access point. If such obstacle is present, remove the obstacle or relocate your server, client devices or router/access point to avoid the obstacle. Check if your server and client devices are located in a different room from where you have installed your wireless LAN router/access point, wireless communication could be unstable due to poor signal strength. Try changing the location of your server and client devices to appropriate location, preferably near the router/access point. Your home network could be unstable due to interference from other wireless LAN networks. If this happens, change the “Wi-Fi channel” setting on your wireless LAN router/access point. Wireless communication problems may occur when using your wireless LAN router/access point without updating to latest firmware. Make sure to update the firmware of your router/access point to the latest version. The security key setting on the unit may be wrong. Confirm the security key setting on your wireless LAN router/access point and set the correct security key on the unit. When I change speakers, playback sometimes starts from the middle of the track and sometimes from the beginning of the track. Depending on the music server, speakers or track, the playback position may change. For some reason "REPEAT-1" no longer appears even when I change the play mode. "REPEAT-1" appears only when you set REPEAT-1 mode on the (network controlled) player. When using this application, only REPEAT On/Off and SHUFFLE On/Off modes are available. If the play mode is not changed using this application, the player continues playback using the displayed play mode. No album art appears when I play back tracks registered in Windows Media Player 11. Windows Media Player 11 does not support the album art feature. After starting this application, the error message "ERROR No speakers are available,Please check the connection and try again." appears, and the application quits. Your mobile device is not connected to the wireless LAN network. Refer to "My mobile device cannot connect to the wireless LAN network" and check the wireless LAN network connection status. The desired music server or speaker does not appear on the music server or speaker lists. Check that the server or speaker is powered on. Check that the server or speaker is connected to the network. -If set to "Manual", please change the setting to "Auto". -If the "Permitted Device" list is full, please delete some unused devices. -If the device you are trying to connect to is shown in "Pending Devices", please delete the device from the list. I cannot play back tracks using the selected speakers. Check the following items after selecting the device. I want to change the PARTY configuration on the PARTY STREAMING screen, but I cannot remove the device with the PARTY HOST icon. You cannot remove a PARTY HOST while a PARTY is in use. If you want to change the PARTY HOST, close the current PARTY and start a new party with another device as the PARTY HOST. Sound skips when playing audio content on a server or while streaming playback in the PARTY STREAMING function. Change the encryption method to AES*1 on your wireless LAN router/access point if WEP*2 or TKIP*3 has been selected. Encryption methods other than AES may lead to unstable wireless communication and it is recommended to use AES for better network performance. For details on how to configure the encryption methods, refer to the operating manual supplied with your router/access point. If you want to enjoy the PARTY STREAMING function in a more stable environment, a wired network environment is recommended. Wired connections of devices, especially for PARTY host(s) are effective for stable network performance. The server does not appear in the server list. If the multicast packet forwarding is limited on your wireless LAN router/access point, the unit may be unable to detect servers on the home network. Disable the multicast setting on the router/access point if enabled and try searching for a server again. For details on the multicast setting, refer to the operating manual supplied with your router/access point. Streaming playback with the PARTY STREAMING function does not start. If the multicast packet forwarding is limited on your wireless LAN router/access point, you may be unable to start streaming playback with the PARTY STREAMING function. Disable the multicast setting on the router/access point if enabled, and try starting streaming playback again. For details on the multicast setting, refer to the operating manual supplied with your router/access point. While playing back a Playlist or Favorites list, when the song is changed using another remote control or DLNA controller application, the next song from the Playlist or Favorite list plays back.. Please stop playback of the Playlist or Favorites list before operating another remote control or DLNA controller application. Some content of Windows Media Player cannot be saved to Favorites list or Playlist. Some versions of Window Media Player do not support saving content to a Playlist or Favorites depending on the folder. Please navigate to the "All Music" folder and add your content to a Playlist or Favorites list from there.